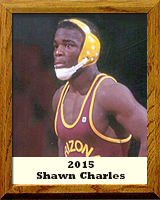 Hester LeShawn “Shawn” Charles attended Santa Rita High School and won 3 consecutive State Wrestling Championships, going undefeated his junior and senior year. He was inducted into the Santa Rita Hall of Fame upon graduation in 1988. After graduating from ASU in 1993 with a business degree from the W.P. Carey School of Business; Charles began an international wrestling career. He proved to be one of the best wrestlers in the world, winning championships, such as, the Takhiti Cup (Iran National Tournament), Manitoba International, US Open Freestyle Nationals, New Your Athletic Club International, two-time Sunkist international & Outstanding Wrestler, Slovakian Grand Prix, Bulgarian International, Turkey International, two-time US Olympic Festival, Espoir Nationals, and Pan American Championships. He was also an alternate for the 1996 Olympic Team. Charles as a D1 Coach: Coach of the Year-PAC 10 Conference, Coached the Outstanding Wrestler in the NCAA Champions, three Academic Male Student-Athletes of the year, 42 All-Americans and 5 NCAA Champions. His international coaching career includes: Pan Am Championship – Cadet Level (Gold) and Senior Level (Silver), two-time World Cup coach, three-time Olympic Support Staff Coach, two-time Ukraine International Tournament Coach. Charles currently lives in Chandler, AZ with his wife Jill and two sons; Shawn Jr. and Titus.